New Zealand novelist Katherine Hayton shares her inspiring success story about her fourth novel’s success in a Kindle Scout campaign, leading to a publishing contract with Amazon’s own imprint, Kindle Press. 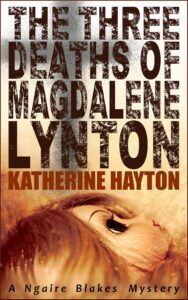 Back in January, I ran a Kindle Scout campaign for my fourth full-length novel, The Three Deaths of Magdalene Lynton, and was accepted for publication by Kindle Press on the 8th February. After the effort of the campaign, I was excited to be selected, and so far my experience with Kindle Press has shown me they can sell a lot more of my books than I could manage on my own. I’m in my second month (release date 29th March) and I think I’ll have earned out my advance by the end of this month, or early next month, so it seems on track with their expectation of 25k over five years. Because they’re an Amazon imprint, they have access to place their published books on the advertising slots available to Amazon, and their aim is to place each book in some kind of promotion every ninety days or so. These range from month long $1.99 promotions in genre selections to individual book titles featured on the $0.99 Kindle Daily Deals. From talking with other authors in Kindle Press, there are mixed results among the books they’ve selected. Some authors have taken a year or more to earn out their advance of $1,500, while others have earned over $12,000 in their first year. An author with Kindle Press retains a lot more control than they would with a larger press, so I had final say over all edits, title, cover, and book description. Anything else (eg categories) can be suggested but not necessarily taken on board. The pricing is determined by word count and seems unshakable apart from a book’s inclusion in discounted pricing promotions. If there’s anything about the book that Kindle Press thinks will harm the chances of promotion slots, they’ll discuss it directly with the author so they have the chance to either change it or stick to their own vision. The contract is available for anyone to view on the Kindle Scout website and is written in plain English. The rights taken up by Kindle Press are for the ebook and audiobook only, although they haven’t created any audiobooks from the selected winners so far. Authors retain the print rights, so I’ve put mine out through Ingram and Createspace as I usually would. The royalties are lower than for self-publishing, at 50% rather than 70%, but the agreement includes KU & KOLL at standard book prices rather than pages read, so authors earn their full 50% royalty on a book once it’s 10% read. They also include editing, although that doesn’t form part of the contract, and either perform that in-house or contract out to Kirkus. It’s a new, small press so the staff working there are stretched pretty thin. That said, I’ve had two issues that I needed an urgent response to and on each occasion I had a response within a few hours. Non-urgent responses can take a lot longer though, and there are some responses that seem to come straight from Amazon’s stock email reply reservoir. There’s also a support group on Facebook for Kindle Press authors that is very active. They share a lot of information and experience, similar to this group, so new authors have support on their journey. Kindle Press authors cover a wide range, from multiple titles self-published to debut authors, from traditionally published to published through other Amazon imprints eg Thomas & Mercer. At least two of the books initially picked up through the Kindle Scout campaign (there may be more) were signed to Little A, and one of the initial Kindle Scout authors was later republished by Montlake and currently has a Kindle World operating. My experience so far has been great. There were a few teething issues getting my book out to publication (blurb wording which I later overrode in Author Central and a few conversion errors) but they were all sorted quickly. Everyone I’ve dealt with at Kindle Press is lovely, and the authors group is fantastic and very collaborative. Some of the previously self-published authors have expressed concern over not having full control of price pulsing as they would with their own publications. With pricing promotions, there’s often no lead time, so where self-published authors would like to try for simultaneous placement with ENT, Bookbub etc they aren’t able to. Personally, I’m happy for Amazon to deal with marketing while I deal with writing the next book in the series. To me, it’s a luxury to be able to sit back and not worry about organising the next Kindle Countdown Deal, or try for another email promotion spot. 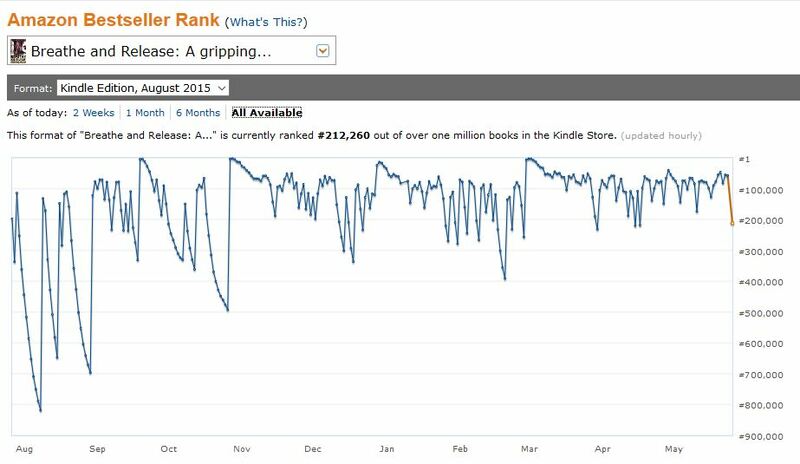 I’ve attached a graph showing the difference between what Amazon has achieved (without a price drop or similar promotion) and what I managed with my last self-published title using a bit of everything. This is the first time I’ve published a series, and I’m still ecstatic that Kindle Press accepted my book for publication. 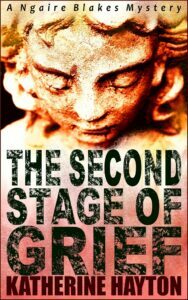 I’m pleased with the results so far and will be attempting to sell my second book in the series, The Second Stage of Grief,directly to Kindle Press at the start of June. Wish me luck! Have you had experience, good or bad, with Kindle Scout and Kindle Press, or any other Amazon imprint? We’d love to hear how you go on! 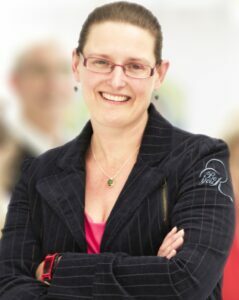 Katherine Hayton is a 42-year-old woman who works in insurance, doesn't have children or pets, can't drive, has lived in Christchurch her entire life, and currently resides a two-minute walk from where she was born. She has self-published three mystery novels and is still on a steep learning curve that she wishes would stop soon because she hates exercise and heights. Almost equally. spelling issues and I in finding it very troublesome to inform the reality nevertheless I’ll surely come again again. Great information! How do you handle the print version of your book? Do I need an agent to apply for Kindle Press? My stories are MG Fantasy and YA Romance (some have a fantasy element) but I keep reading that I need an agent to get a publisher, but maybe this is a different type of publishing. Great article and thought provoking graphs re the value of Amazon marketing. My question, though, concerns the campaign itself. Is this a chicken and egg story? i.e. do you need to have a huge following already in order to become successful during the campaign? I have a nice little blog that I love, with quite a bit of traffic for my how-to articles but little for my fiction. I also have a presence of sorts on Twitter but next to nothing on Facebook [or any of the hot social media sites]. Would there be any point for someone like me to apply to Kindle Scout? I hope to enter my novel in Kindle Scout by this fall. Thank you for sharing your experience and congratulations. As a fairly new fellow Kindle Press author I agree with Katherine. My experience has been great so far, with sales far exceeding what I have imagined. I would have no hesitation submitting my next novel to Kindle Scout, although I am aware that in addition to lots of new authors, many of the existing Kindle Press authors are submitting second and third novels. Just to repeat what Lexi said above, the nominations and Hot & Trending on Kindle Scout do not appear to be the deciders in the campaign, more the writing and commercial viability of the novel. My novel, Random Acts of Unkindness, is on the way to earning out the advance in the first month and hopefully, with the promotional help from Amazon and the publication of a prequel and sequel within a year, my publishing strategy be successful. Good article – as a fellow Kindle Press author I’d agree with pretty much everything Katherine says. The ‘popularity contest’ aspect is something you can forget about, in my experience. Having a well-written book with a good cover is worth any number of nominations and hours in Hot & Trending. I did virtually no campaigning. My novel, The Trouble with Time, earned out in its first month, but as Katherine says, some books are not doing so well. I think this is because KP is publishing a great many books – an average of one book every four days. Selection is not a science, and the more they publish, the greater the chance of having a surprise bestseller. I think Kindle Scout is the biggest opportunity out there right now, and very much recommend it. Thanks so much for sharing all the detail, Katherine. It’s so helpful. I’m glad I “knew you when” you were starting that KS campaign, and I knew you had a great chance with solid writing. So glad for you. Thanks for this information and your experience dealing with Kindle Scot. I have a new book just days away from print. Big decisions as to how I am going to handle this one, my forth, remain an issue. Like you, I just want to write. I have already completed the cover, editing, formatting, etc, so there is a question of apples and oranges. But the book is not going to sell itself… well, I hope it will, but it is going to take a lot of work. With the other books, I hit the road and did a lot of book signings, in addition to the books being on Amazon, KDP. I was really amazed how well they did in the European and Asian markets, but that came about mostly due to word of mouth. Congrats on your success with this! I have pondered giving Kindle Scout a try (I’m currently in a fairly successful experimental stage with Kindle Worlds). I have heard it’s kind of a combination crap shoot-popularity contest when it comes to getting “votes” though. How did that work for you? Hi Liz, we never actually find out how many nominations we get, although Amazon share a lot of data about page views and where the traffic comes from. Most of my campaigning was through Twitter which is my social media hang-out of choice and I ran a gleam giveaway for a $25 gift card to drive traffic as well. I’m currently campaigning again and just hanging about on Twitter for this one. We don’t have any official notification of how Kindle Scout selects books for publication, but from the experience of the people selected there isn’t a strong correlation between views and selection. 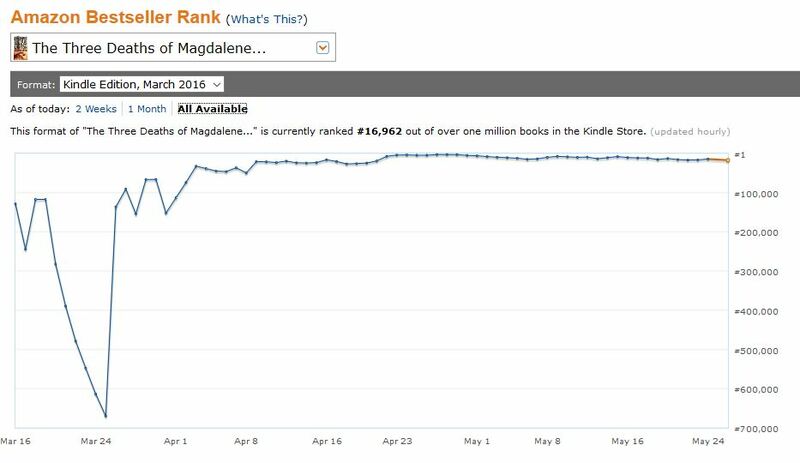 Having a great book and cover seems to rank a lot higher than your author platform or campaign views.